These boys have a great story full of love, loss and adventure. One of the AHAR reps was at the Long Beach Animal Shelter and while standing in the lobby she witness a very sad man bringing his dogs into the shelter. She asked why he was giving them up and he gave her his story. He has been helping his wife battle adult leukemia and in all her treatments she became allergic to all there animals. He looked so broken and started to get teary eyed. He actually had all their toys and beds with them not realizing that the dogs would never get their stuff in the cage. The rep told him to meet her in the parking lot and she would tell him more about AHAR. 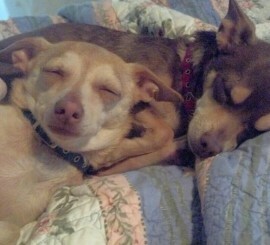 That day Knuckles and Gizmo became part of our rescue. Since that day the wife has lost her battle with leukemia but before she did, she and her husband were able to come to the fosters home and see that their boys were healthy and happy. A couple friends (husband and wife) of the fosters were visiting from Spain, met the boys, heard their story and just had to adopt them. Knuckles and Gizmo are now speaking Spanish, Italian and English while living the rest of their lives in Spain.